This guide is designed to introduce WFU researchers to the major tools used to measure research impact (aka research metrics, bibliometrics, scientometrics, altmetrics, etc.). There are a number of bibliometric indicators focusing on measuring impact of scholarly journals. Most of these measures are calculated from the pool of journals indexed in two citation indexing databases: Web of Science or Scopus. All metrics based on Web of Science-indexed journals can be access via Journal Citation Reports. Impact factors remain an important means of measuring research influence and dissemination, but they have recently have become controversial, e.g. DORA (Declaration on Research Assessment, sponsored by the American Society for Cell Biology, which makes "recommendations for improving the way in which the quality of research output is evaluated" with less emphasis (or even no reliance upon) on journal metrics. The Declaration has had its critics as well--see Kent Anderson's post at the Scholarly Kitchen. Journal Impact Factor, or JIF, is the most commonly-used metric used to indicate journal quality. As the formula below shows, JIF is a 2-year calculation based on the total number of citations to articles published in the journal. A 5-year citation window is an alternative 5-year JIF. JIF is available through Clarivate Analytics' Journal Citation Reports. JIF can be searched by journal name, or browsed by discipline. Journal Rankings discusses these disciplines in more detail. Eigenfactor considers not just direct citations to a journal's articles but rather the entire network of citations that are linked to that journal's articles. The underlying data come from Journal Citation Reports. A journal's Article Influence is a measure of the average influence of its articles over the first five years after publication. It is comparable to Journal Citation Report's Impact Factor. Eigenfactorizer is a free plugin for the Chrome browser that color-codes the results of your PubMed search results according to the Article Influence Score of the journals in which they appear. The H5-index is created by Google Scholar, and is similar to the h-index explained in Author-level Metrics. H5-index "It is the largest number h such that h articles published in [the past 5 years] have at least h citations each". Thus, an H5-index of 60 means that that journal has published 60 articles in the previous 5 years that have 60 or more citations each. H5-median is based on H5-index, but instead measures was the median (or middle) value of citations is for the h number of citations. A journal with an H5-index of 60 and H5-median of 75 means that, of though 60 articles with 60 or more citations, the median of those citation values is 75. To the right is a chart listing the top 20 English-language journals ranked by the H5-index. Both the H5-index and H5-median are available in Google Scholar Metrics. Journals can be browsed by discipline (more information about disciplines is available in Journal Rankings) or searched by keyword. 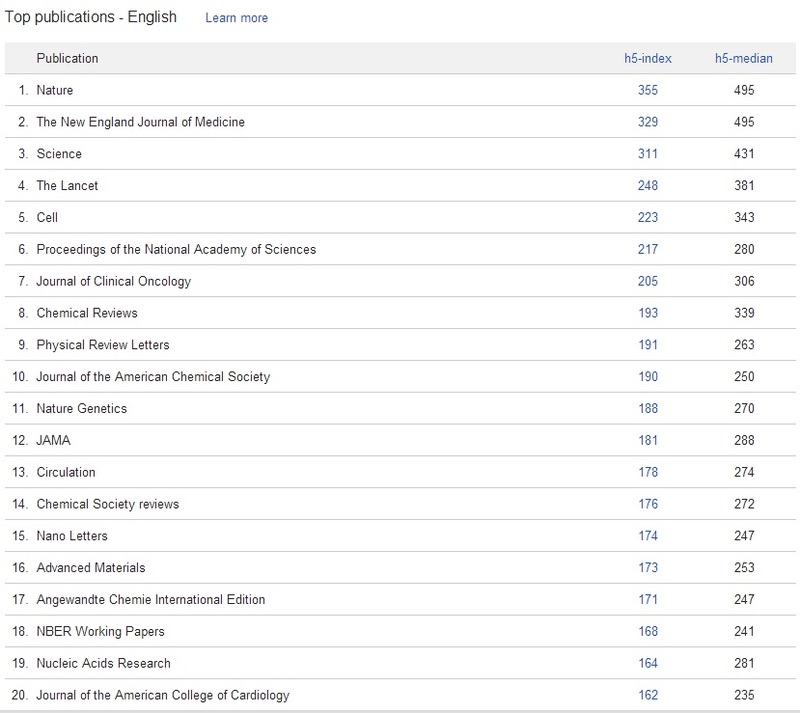 Google Scholar Metrics will only display the top 20 journals for each subject category. Additionally, there is no historical data. 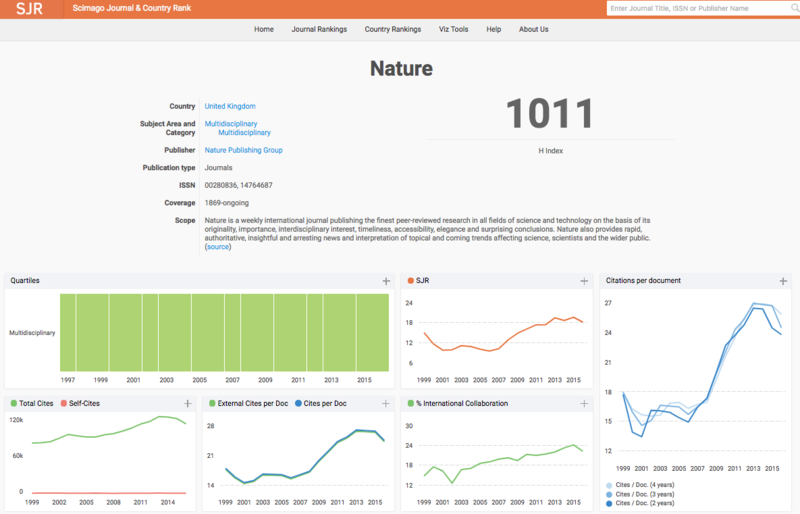 SCImagoJR is a publicly-available tool that uses information from Scopus to rank journals. (The method is based on Google's Page Rank algorithm.) Citation data is drawn from over 21,500 titles from more than 5,000 international publishers and country performance metrics from 239 countries worldwide. Search for a particular journal to view its metrics, or sort by subject area, subject category, or country. Journal rankings can also be organized by h-index, total cites, and other metrics.